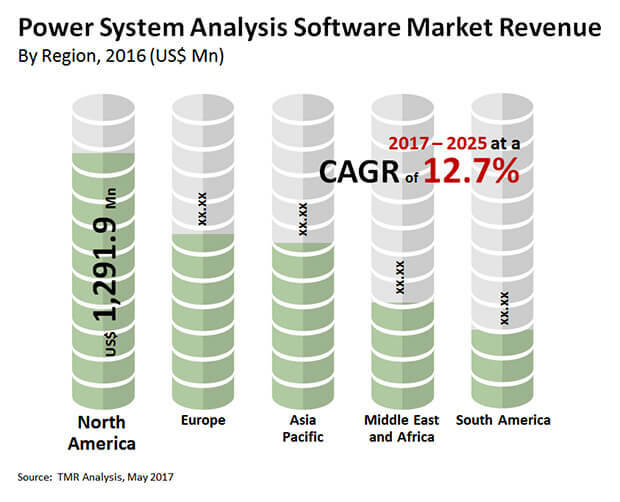 With a highly fragmented vendor landscape, the global power system analysis software market is characterized by the presence of large number of regional players spread across geographies. Leading players within the market have established their status by making their presence felt across the globe through strategic alliances and mergers and acquisitions. With a large number of service providers, the global power system analysis software market can be characterized as being extremely competitive in terms of product offerings. General Electric Company, Siemens AG, ETAP, and ABB are the top players within the market. Leading players within the market are focusing extensively on new product development with the motto of increasing the efficiency of the software, states Transparency Market Research (TMR) in its latest research. According to Transparency Market Research, the global power system analysis software Market be worth US$11,585.7 mn by 2025, expanding at a CAGR of 12.7% between 2017 and 2025. On the basis of geography, it is expected that North America will continue to lead in the market. This region accounted for 33% of the total market in 2016, driven by smart grid systems. In terms of fastest growth, it is expected that Asia Pacific will expand at the fastest CAGR during the assessment period, led by China, India, Japan, and Australia. In terms of implementation model, this market is segmented into cloud-based and on-premise. Of these the on-premise implementation segment accounted for a whopping 81% of the total revenue generated from the overall power system analysis software market in 2016. This growth is on account of on-premise implementation at power utilities buildings. On the other hand, the cloud-based implementation segment will exhibit a steady growth in the forecast. On account of the growing penetration and widespread outreach of the internet. According to a TMR analyst, the primary factor fuelling the demand for power system analysis software is the rapidly increasing investments towards smart grid technology. Across the globe, the demand for electricity has increased. This can be attributed to the growing industrialization and urbanization. Therefore, the surge in the demand for electricity has compelled utility companies to boost their production of energy including setting up new power transmission networks as well as boosting their existing power transmission capacity. Utility companies are also focusing on expanding or increasing the capacity of the existing power lines and grades as well as any other associated infrastructure which can enhance the efficiency of electricity production and transmission. With smart power technology requiring system analysis software for the monitoring of great performance as well as for enabling condition-based maintenance, the growth of the power system analysis software market is assured during the forecast period from 2017 to 2025. Apart from all these factors, the global power system analysis software market also receives impetus from government bodies as well as regulatory agencies which are advocating the implementation of smart power technologies. Government bodies are boosting the adoption of smart water technology by providing incentives. In addition to this, regulatory mandates by concerned bodies will also help boost the growth of the global power system analysis. With increasing deployment of smart grid technology in developing nations, the demand for power system analysis software is also increasing.